Cozy, clean, private 2 bed, 1 bath located in a safe complex in the heart of Mount Pleasant!! 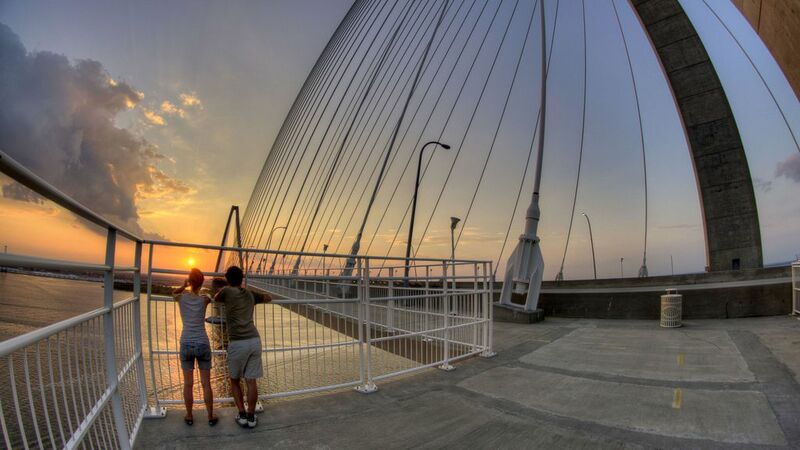 Whole Foods, Trader Joes, and several dining options walkable, and 1 mile to the base of the Cooper River Bridge on the Mt P side! 4 miles to the beach and 4 miles to the heart of downtown Charleston, 1 mile from Shem Creek and other shopping/food/nightlife. Pier to view the ocean and full clean playground 1 mile away, great for kids and dogs to play and run around! Plenty of space with a full dining room, living room, kitchen, and 1 private bathroom. 2 full bedrooms, along with a comfy big couch. Plenty of other floor space throughout the condo for additional air mattresses if need be. If you're wanting to see some of the beaches as well as downtown, you can't beat the location. Significantly cheaper then the beach prices, and only 4 miles away! $8 uber ride to the downtown nightlife. On top of the location and price, it's recently renovated with new furniture, granite, and hard woods! Wonderful location for walkers, Shem's Creek is a doable walk, food shopping is literally around the corner, and it is a short ride to the bridge to Charleston. Unfortunately, the location is not near the pics shown In the listing, but perhaps this was my own inexperience at choosing listings. Some TLC would have been nice and made us feel welcomed. Ths bathroom needs some basic but necessary attention and I would have the housekeeper come right before the guests arrives so the odor of mildew is not prevalent upon entering. We did enjoy our stay despite these issues, but having been to this area many times, I believe we would have been able to find a nicer living arrangement for less the cost. We did leave a day early. Everything was great except not hardly any TV selections to watch and no TVs in the bedrooms. Overall we did have a wonderful stay, but next time we will be more prepared by bringing a Roku or DVD player to keep us occupied. Convenient location. You can walk to Trader Joe's (3 min walk) and to Whole foods. Shem Creek and a multitude of good restaurants are only a quick 2 minute drive down the street. You can easily get to downtown Charleston which is literally just over the new Hwy 17 bridge. We are not out late (older couple who stays home at night) so we would have enjoyed a few more channel options on the television. Unit is spacious and clean with comfortable beds and ample parking. Stocked with the kitchen necessities (although tough to reach the microwave which is on top of the refrigerator.) Bathroom is nicely remodeled but would benefit from resurfacing the tub and updating the shower mechanism which is tough to operate. Overall we had a great stay and would stay at this property again. Thank you Jay for being so attentive to our questions and needs! We loved staying here and will be looking to book again in the future! The condo was very clean and freshly renovated and had nice decor! The booking, check-in, and check-out process was super easy! There was some construction going on outside, but if there was any noise, we didn’t hear it. Overall, we had a great experience! Perfect location to the beach and downtown. Would recommend and stay again. extensive than expected but wouldn't deter me from staying again. It would be nice to have more tv channels or a DVD player for evenings or rainy days in. Overall had a wonderful time and enjoyed Mt. Pleasant and surrounding area.